In order to secure your company file data, the one best way is to create a backup of your QuickBooks desktop company file. The backup copies will protect your company file against accidental data loss. You can always restore your company file using the backup copy. QuickBooks also provides various automatic data backup and recovery features. You may contact our QuickBooks support team @ 1 (877) 227 2303 to get the best security solutions for your company data file. How Quickbooks Support Help you to create a Backup? Follow the steps below in the given order to create a manual backup of your company file. 1. Open QuickBooks in a single user mode. 2. Go to file>backup Company>create a local backup. 3. Click on local backup and choose the option button. 4. Browse a location for the backup copy. 5. Once you choose the location, click OK.
6. Look for the other options shown, and select accordingly and click OK once you finish. • To distinguish between the backup files, check the Add the date and time of the backup to the file name (recommended) option. • You may also put a reminder to remind you to create a backup of your company file. • You can also select the option of verifying data every time you save a backup. This will help you to detect if there is any damage in your file. 8. Choose when you want to save the backup. Either you can save the backup now or you can schedule it for the future as well. If you choose to save it now the backup will be saved, by default, in the location you selected in the backup options. Or if you want to save it to a different location, you may change the location as well. Once you choose the location, click on save to create the backup of your file. a. Put a check on save backup copy automatically when I close my company file option, to save the file when you close the QuickBooks. b. Set a time for the backup. Click on the new button, choose a location and select the date and time for the backup and click OK.
c. Click Finish, once the task is completed. You can also clear the memory occupied by QBBackup Temp Folder. The QBBackup is a temporary folder that contains QuickBooks file components during the QuickBooks backup preparation process and gets automatically deleted once the backup is completed. If the folder does not get deleted you will get a backup error failure message. In some backup error cases, this folder may remain and you can delete can be deleted manually as well. If you are a windows user, your windows will not allow you to delete the temp folder. In that case, you can simply reach our QuickBooks Support team on 1 (877) 227 2303 for help. 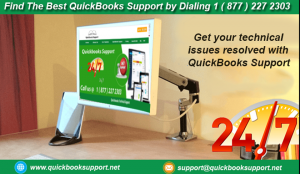 QuickBooks Support Experts Guidance for Overcoming Payment Unrecoverable Errors!